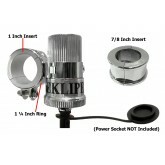 Choose your Color: Chrome or Black • 6 ft 6 inch total length to reach anywhere on your motorcycle • Easily mounts directly on all 7/8 inch, 1 inch, and 1.25 inch handle bars with adjustable mount • Charges all mobile electron..
Our NEW EKLIPES™ Patented Design EK1-125 Bike-2-Bike Jr. Plug-In 2000 Amp EZ Jump-Start Kit is the perfect accessory item for our Cobra Series (EK1-110/B/BC) and Viper (EK1-109)! 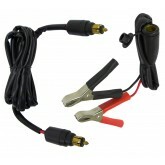 This package includes our 5ft Bike-2-Bike Jump-Start Extension Cable with 2 Male DIMS BMW style Connectors t..
Our Patented EK1-153 EKLIPES™ 2000 Amp EZ Jump-Start 12 Volt Battery Harness is the First and Only one of its kind! 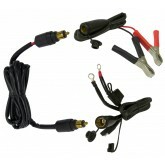 This State-of-the-Art 2 Ft Battery Harness (Capable of handling over 2000 Cranking Amps!) 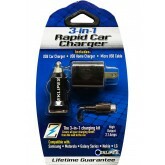 is actually 2 Battery Harness’s in one housing that comes with water-proof caps.. The New Patented Design, EK1-115 EKLIPES™ Bike-2-Bike Plug-In Universal Jumping Kit is like no other Jumper Cable System in the World! For the First time EVER, you can now Jump-Start one Motorcycle or Power Sport vehicle from another by Just plugging directly into the 2000 Amp Female BMW pl..
EKLIPES™ EK1-165 Co-Pilot Cell Phone Handlebar Mount easily and securely mounts your device onto any common size handlebars (7/8 Inch, 1 Inch, and 1 ¼ Inch). 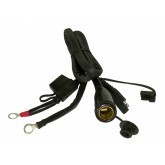 Perfect for use on either bicycle or motorcycle and is universal for other power sport vehicles like ATVs. 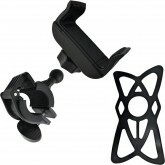 The silic..
• Securely fits any phone up to 3 ¼ Inches x 7 Inches • Durable Flex ball joint allows 360° rotation and flexibility • Designed with Quick-fasten technology for easy on-the-fly mounting and removal • Easily mounts d..
• 12Ft total length for extra reach • Made for iPhone ( X / 8 / 7+ / 7 / 6s+ / 6s / 6+ / 6 / 6SE / 6c / 5s / 5 ) • Made for iPod ( Touch 6th Gen / Touch 5th Gen / Nano 7th Gen ) • Made for iPad ( 6th Gen / 5th Gen / 4th G..
• 12Ft total length for extra reach • Made for Micro-B phones (Samsung, HTC, LG, Motorola, etc.) 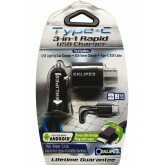 • Made for Micro-B tablets (Samsung, Kindle, Hauwei, Asus, etc.) 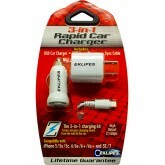 • For other Micro-B devices (cameras, headphones, powerbanks, et..
• High output (2.1 Amps) Wall and Car Charger for fast charging • Made for iPhone ( X / 8 / 7+ / 7 / 6s+ / 6s / 6+ / 6 / 6SE / 6c / 5s / 5 ) • Made for iPod ( Touch 6th Gen / Touch 5th Gen / Nano 7th Gen ) • Made for iPad..
• Early Warning Failure Detection for Batteries AND Stator Units • Digital Voltage Display also reads the output of vehicle battery • Automatically adjusts current to avoid overcharging devices • LED lit USB ports make pl..
• High output (2.1 Amps) Wall and Car Charger for fast charging • Made for Micro-B phones (Samsung, HTC, LG, Motorola, etc.) 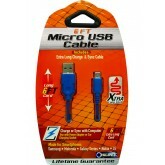 • Made for Micro-B tablets (Samsung, Kindle, Hauwei, Asus, etc.) 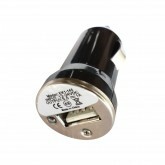 • For other Micro-B devices (ca..
• High output (2.1 Amps) Wall and Car Charger for fast charging • Made for USB-C Phones (Samsung, HTC, LG, Motorola, etc.) 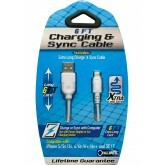 • Made for USB-C Tablets (Samsung, Nokia, Asus, etc.) 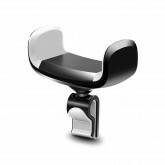 • For other USB-C devices (cameras, headphon..
Our New EK1-161 EKLIPES™ Chrome Viper Solid Steel Adjustable Dual Ring Handle Bar Mount is perfect for mounting our EKLIPES™ Chrome Viper Power Socket (EK1-109) and EKLIPES™ Black Viper Power Socket (EK1-108) directly onto your Motorcycle Handle Bars. 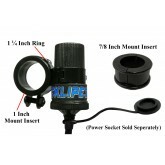 This Mount is the first of ..
Our New EK1-161B EKLIPES™ Black Viper Solid Steel Adjustable Dual Ring Handle Bar Mount is perfect for mounting our EKLIPES™ Black Viper Power Socket (EK1-108) and Chrome Viper Power Socket (EK1-109) directly onto your Motorcycle Handle Bars. 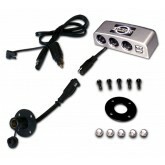 This Mount is the first of its kind with a..
Our Patented EK1-214 EKLIPES™ Silver Motorcycle Tank / Saddle Bag Multi-Port Charging Station is the Ultimate Power Sports Charging Station with Three 12 Volt Power Sockets, 2 USB Ports, and an LED indicator light, and perfect for charging all your mobile devices and equipment within the sa..
Our Patented EK1-214B EKLIPES™ Black Motorcycle Tank / Saddle Bag Multi-Port Charging Station is the Ultimate Power Sports Charging Station with Three 12 Volt Power Sockets, 2 USB Ports, and an LED indicator light, and perfect for charging all your mobile devices and equipment within the sa..
Our New EK1-145 EKLIPES™ 12 Volt USB Adapter simply plugs into any 12 Volt Power Socket and charges mobile electronic devices such as GPS, iPods, MP3 Players, Cameras, Bluetooth headsets, iphones, Androids, Blackberries, Tablets, eReaders, and More! 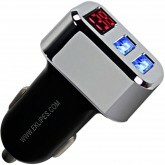 This Unit works great in cars or cruiser ..
ALL EKLIPES™ Products have USA and Worldwide Patents or Patents Pending. The Trade Name EKLIPES™ is a Registered Trademark of Brookshire Innovations, LLC. And may not be used or reproduced without the expressed written consent of Brookshire Innovations, LLC. Roseville, California USA.